The Los Angeles Union Station just kicked off its schedule of eclectic summertime entertainment and cultural programming, Summer Sessions ‘18. Alexa Meade turned a portion of Union Station’s Historic Waiting Room into an original 3-D painting. She painted model Justine Jaime in the lobby of Union Station on Thursday. 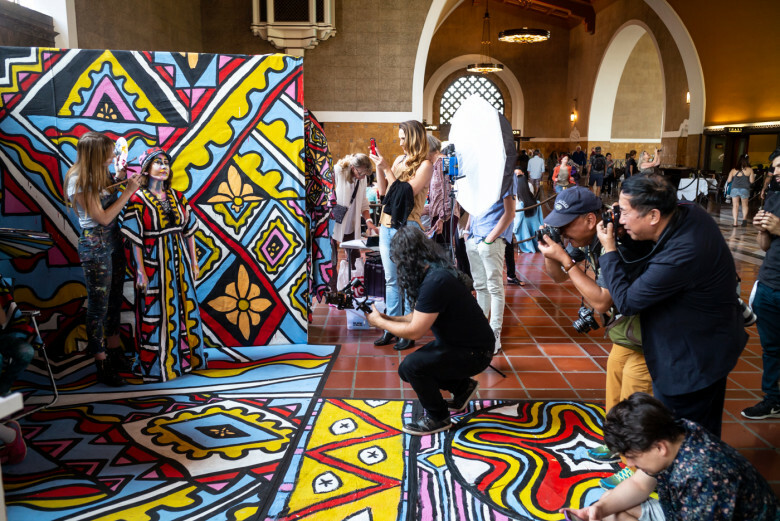 Alexa’s original 3-D painting was part of Summer Sessions 2018 at Union Station and allowed commuters to become part of the 3-D painting. Alexa set up a temporary studio in the Waiting Room of the 1930s-era transportation hub and painted a model while inviting passers-by to don painted clothing and props and step into the scene. Commuters took selfies of the living artwork. More information about her Union Station project click here.